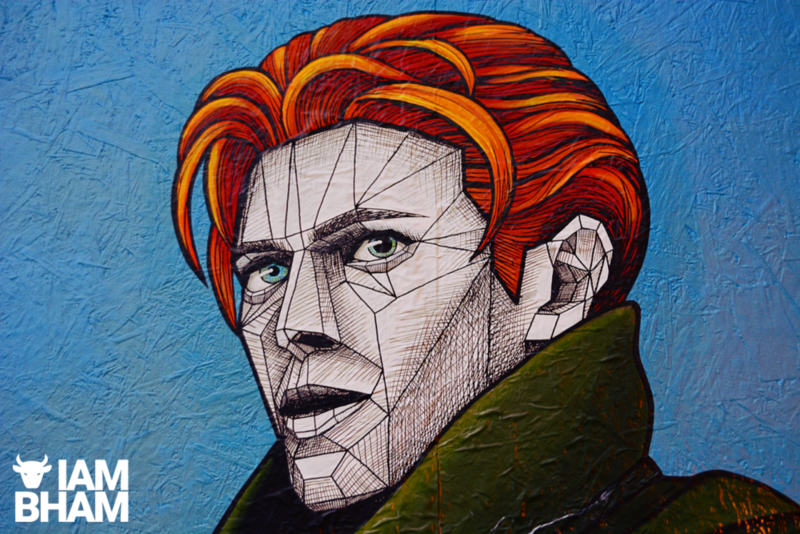 Birmingham based artist Annatomix produces a dazzling new tribute to David Bowie on the third anniversary of his death. 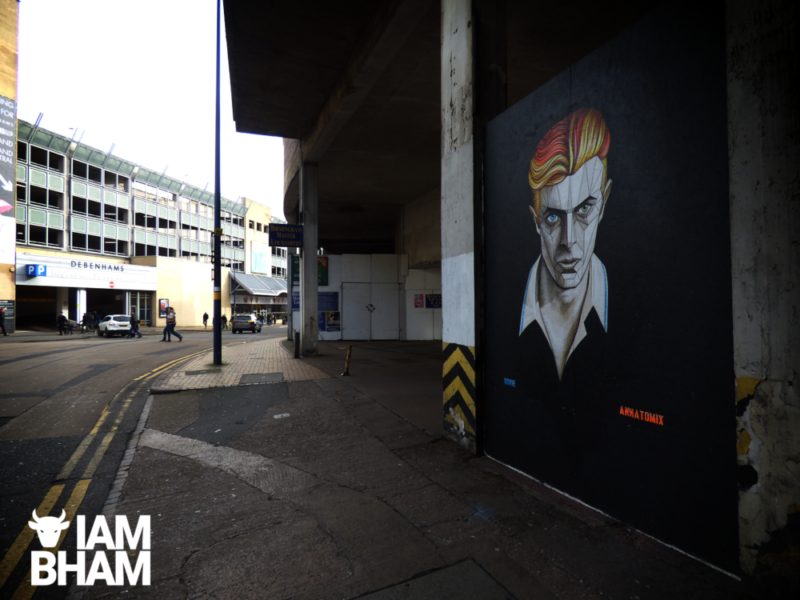 Birmingham based artist Annatomix has produced a vibrant new tribute to David Bowie which went up in Birmingham’s Southside on the third anniversary of Bowie’s death. Annatomix, who also has a music background, has taken part in several key street art festivals including the Hi Vis Fest, Upfest, and Mood Indigo Festival, and she has also painted in iconic street art locations such as Shoreditch. 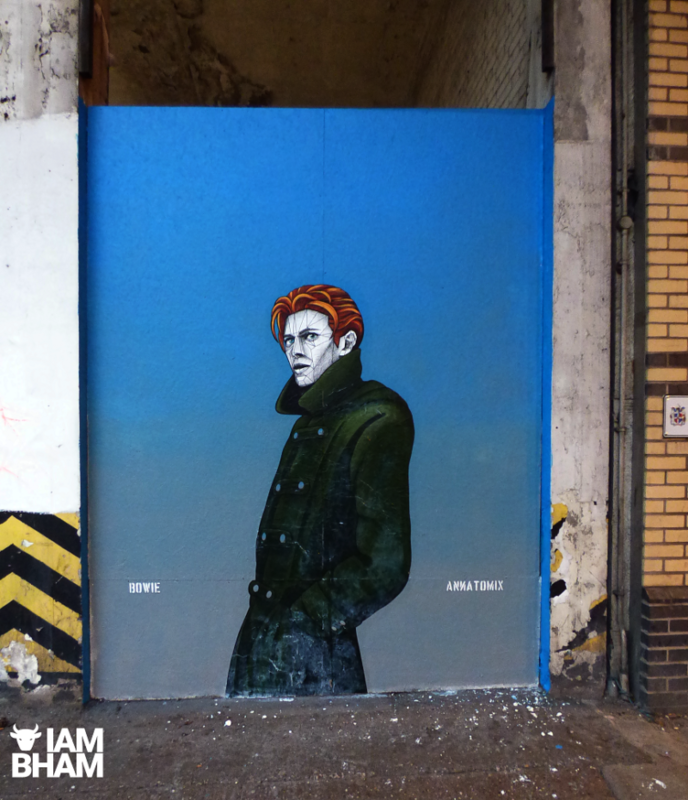 Following the death of David Bowie in 2016 there was a response from the world of street art to acknowledge his passing with artistic tributes in various cities. 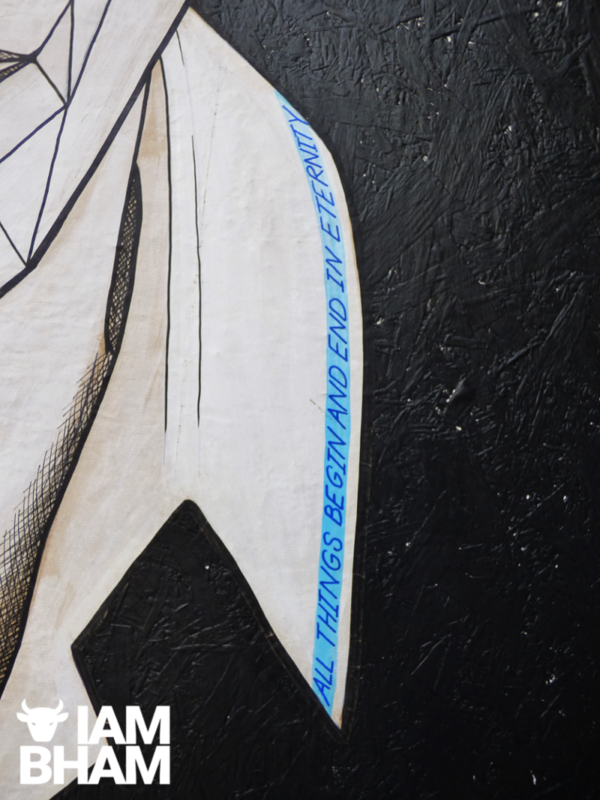 Annatomix produced her piece which went up on Dudley Street in Birmingham. The work was well received and people travelled from different cities to see the art, and the social media response was very positive. 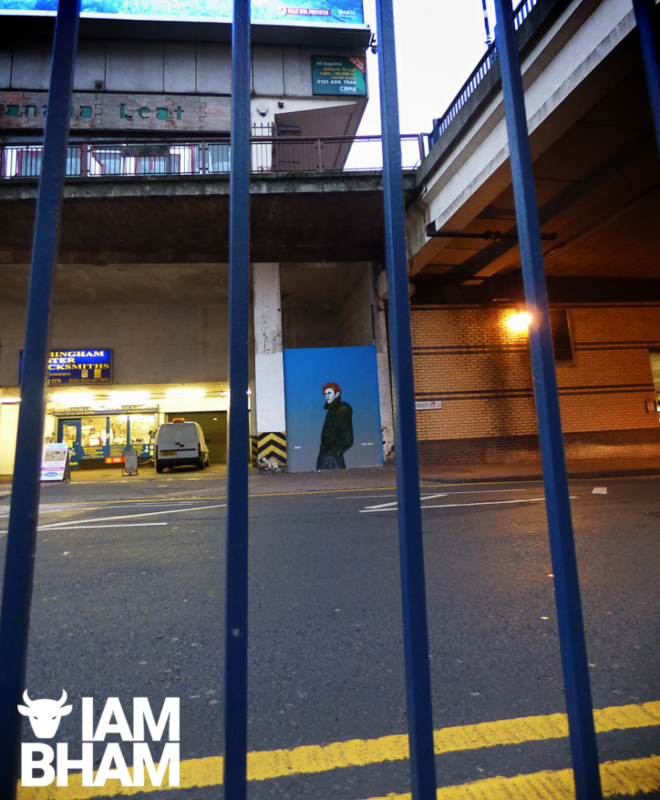 A small patch of Birmingham City centre that is often overlooked by locals and tourists soon became a focal point for art lovers. Photographers flocked to the location to take pictures of the iconic artwork. However, over time some people began to tear off bits of the art as mementos. 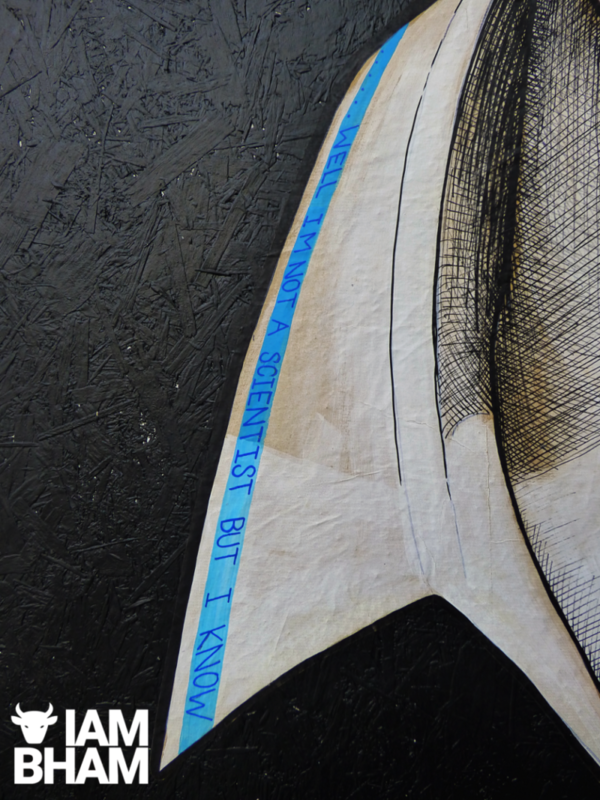 The collars of the shirt that Bowie wears in the art had quotes written across them – “Well I’m not a scientist. But I know all things begin and end in eternity”. These lines are a reference to the British science-fiction film ‘The Man Who Fell to Earth’ which David Bowie starred in. The weather also began to take a toll on the art and the material began to peel and decay. Annatomix carried out repairs but with the passing of nearly three years the art eventually deteriorated. 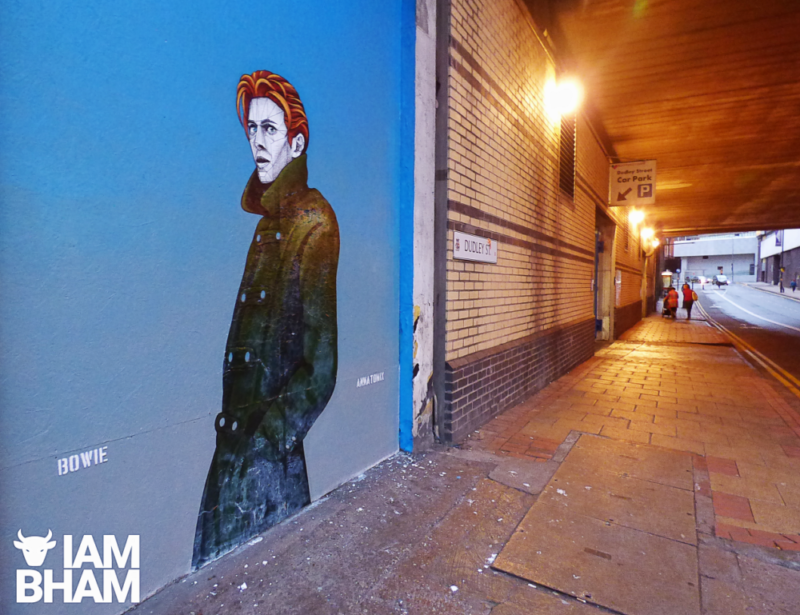 Upon her recent return to Birmingham from Mumbai in India, where she took part in the Mood Indigo Festival and painted a huge tiger mural, she set about producing a fresh new artwork depicting cultural icon David Bowie. 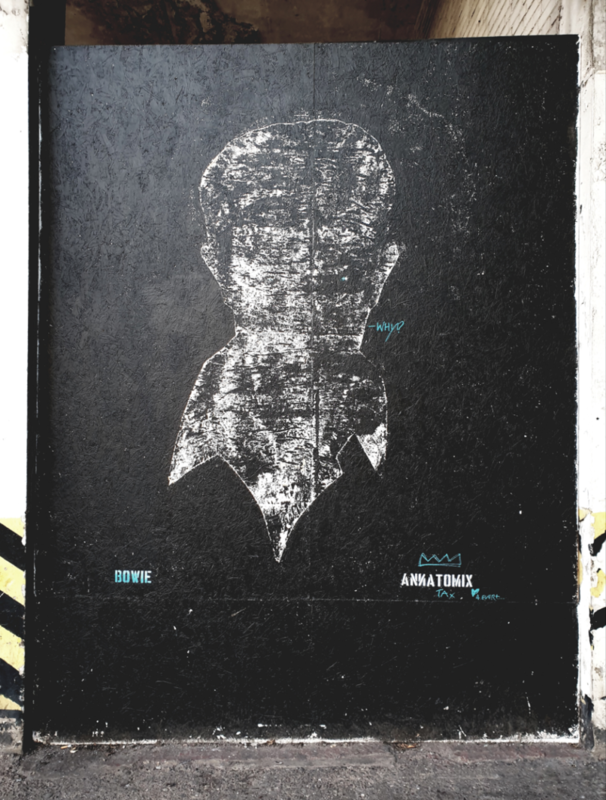 On the third anniversary of David Bowie’s passing the original art was finally taken down by Annatomix from the Dudley Street location. A passerby offered to buy the remnants but the artist declined. She plans to frame the fragments. 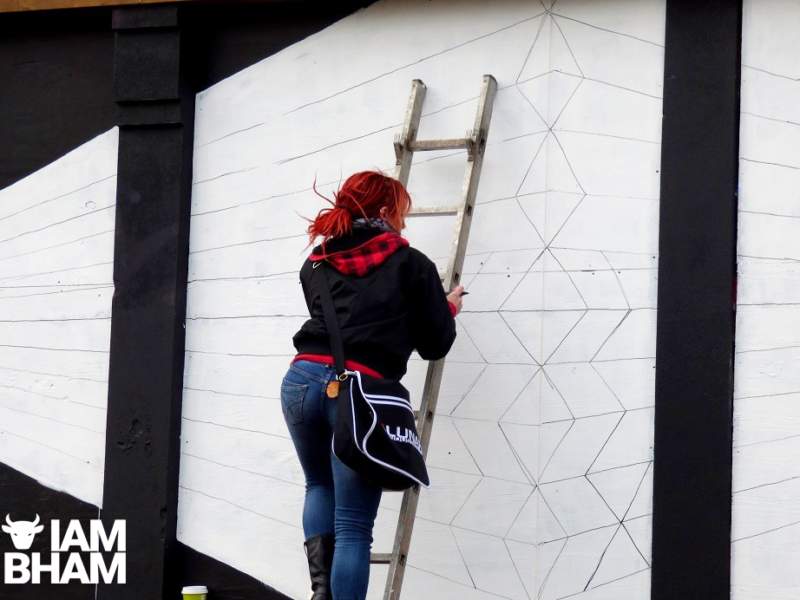 Annatomix kindly agreed to be interviewed and shared her views about the new art, and she also spoke about her thoughts about the current state of the Birmingham art scene and her hopes for some positive change. David Bowie was a cultural icon who influenced the world of art, music, and fashion. What quality about Bowie inspired you? There are so many aspects to his talents that I found inspiring but I think ultimately, it was how he remained so steadfast about his own work and the way he pushed himself that truly inspired me. He didn’t compromise – if he didn’t like a project, he didn’t do it. He seemed to have a certain level of integrity as an artist that I think most of us would aspire to. Plus, he was a weirdo and he knew it, and he went out and made that weirdness work for him. That’s a massive inspiration to a fellow weird kid with low self-confidence! Your original tribute to Bowie was loved but it suffered damage over time. How did you feel about bits of the art being torn off by fans? It’s been overwhelmingly humbling to see how well loved that tribute had become and honestly, I’m stunned that it lasted nearly three years. It was a hand painted poster so it wasn’t designed to be permanent and the weathering over time was totally expected. They’re quite delicate so if they don’t get ripped or tagged over, the weather will eat them up quick enough. It’s part of the nature of street art and I think most of us that make this kind of work actually really enjoy seeing the decay. If we wanted these works to last forever, we wouldn’t be putting them out on the street. 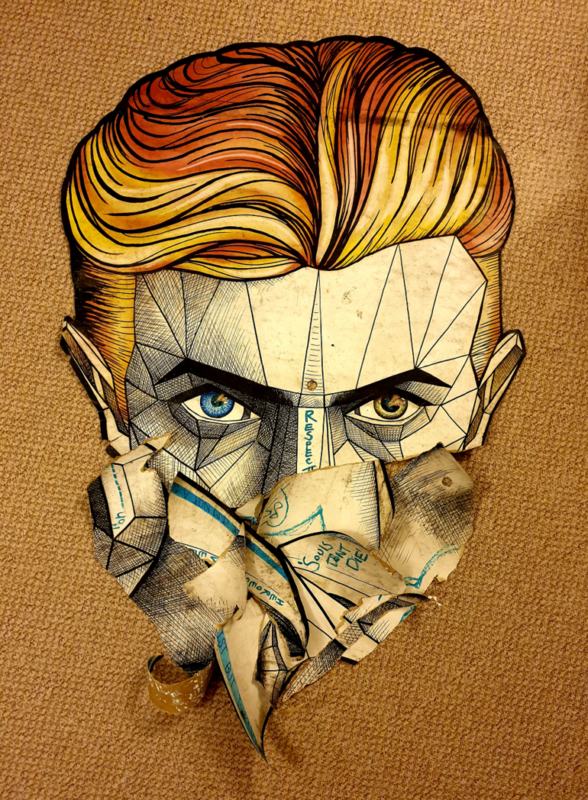 What materials did you use when working on the new Bowie artwork? It’s another hand painted poster so the main image is acrylic paint on brown paper. The wall was repainted with emulsion and the poster pasted on top. I spent a long time cleaning the wall up this time though so hopefully, he’ll stay looking fresh a bit longer. The remains of the old poster have been saved and will be framed up soon. Birmingham City is going through vast change and many music and arts centres have lost support from the Arts Council. What are your feelings about the lack of support for local artists? Can the council and government do more to help aspiring artists? Unfortunately, it’s been like this for a long time and it doesn’t seem to be improving. I worked in the local music scene for many years before moving into art, so I’ve seen the impact there too and it’s heartbreaking. We have a city full of hard working talent, in so many creative industries and yet so much of it gets overlooked because the city isn’t doing enough to champion it. Funding of any kind seems very hard to come by here, and even if you can get it, keeping it going from one project to the next is even harder. In terms of street art, we are leagues behind other cities in the UK. We’re not short on artists, but we are short-sighted when it comes to the impact of their work and what it can do for tourism. It’s not that Birmingham isn’t open to it either – a lot of people enjoy the colour, a lot of businesses enjoy the attention and custom it brings them, some of them even use the street art and graffiti to advertise themselves – but it’s rare that anyone wants to pay for it, or give it the credit it deserves. This is why most of our artists are being recognised and working in other UK cities or abroad. I frequently find myself having to explain that I’m from Birmingham, not London. If we want to inspire young creatives in this city, we need to start appreciating and shouting about what we already have here. Can you share one bit of advice that has inspired you over the years? “If you feel safe in the area you’re working in, you’re not working in the right area. Always go a little further into the water than you’re capable of being in, go a little out of your depth, and when you feel that your feet aren’t quite touching the bottom, you’re just about in the right place to do something exciting” – David Bowie, 1997.